When it comes to invasive species, it is sometimes hard to understand the true cost and toll they take on the world around us. What could be bad about plants imported to reduce soil erosion, for example? Other times it is clear as day, like when an invasive species dominates the forest landscape, prevents sport-fish from spawning, or is harmful to touch like giant hogweed. The truth is that an invasive species can be any plant, animal, or micro-organism that might cause harm to the environment, biodiversity or human health, even if they also have useful traits. Although some species are more prolific than others, a trademark of most invasive species is their ability to outcompete native species for food (and other resources) and dominate an ecosystem if left unchecked. 49% of threatened or endangered species are in demise as the result of invasive species introductions . By pushing out native rivals, invasive species often disrupt food webs, alter the ecology of the local ecosystem, and can ultimately lead to the extirpation of other native species. It is a global conservation issue with large scale ramifications and one important question to address is why these species are so successful when introduced to new locations and environments. By relocating living organisms to new habitats, it is frequently the case that their destination is outside the range of their native predators and diseases, two of the biggest restrictions on population growth. Without these limits, it is possible for species to rapidly reproduce and expand their populations, whether they are continents away from their native range or as close as the state next-door. In this way, invasives can completely displace native species and create monotypic stands, or monocultures. This environment decreases the biodiversity of the area and in turn disrupts the local food web. Negative impacts to the habitat and resulting decreases in biodiversity in turn produce decreases in ecosystem quality. For example, Eurasian water milfoil outcompetes native aquatic plant species for space and nutrients. By outcompeting the natives and through shear abundance it creates low oxygen environments via decomposition where native fish and aquatic invertebrates have difficulty surviving. This in turn limits the food supply of organisms higher up the food chain which feed on these species. 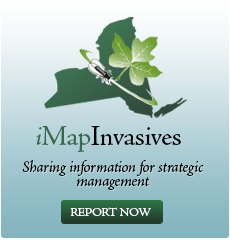 Some invasive species impact health of animals, invertebrates, plants, and humans. Swallow-wort, causes a problem for livestock when injested. Goats, which are sometimes used in invasive species control, cannot ingest swallow-wort as it causes illness. Monarch butterflies will lay their eggs on swallow-wort plants, because it’s a member of the milkweed family, but when the larvae hatch they will not survive due to the host specificity of the caterpillars. Other plants are affected by swallow-wort due to its allelopathic tendencies. By releasing toxins into the ground, swallow-wort inhibits other native plants from establishing. Plants such as giant hogweed and wild parsnip can affect animals and humans. Both plants cause a burn through a combination of coming in contact with chemicals on the plants stem and sunlight. Giant hogweed by far has the most damaging effects through this reaction. In order to prevent decreases in biodiversity and maintain conservation value of our favorite outdoor places, invasive species awareness, prevention and management is important for all flora and fauna that depend on native systems including for posterity.